Nerve (2016). Directed by Henry Joost and Ariel Schulman, based on the novel by Jeanne Ryan and starring Emma Roberts, Dave Franco, Emily Meade. Featuring a cameo by everyone’s favourite vlogger, Casey Niestat. A paltry 6.6 stars on IMDb, Nerve clocks in at a very healthy 1 hour 36 minutes long – which, as we all know, is nigh-on the perfect length for a movie at a shade under 100 minutes. Venus “Vee” Delmonico is a high school student desperate to leave home, but ends up embroiled in ‘Nerve’, an online game where the Watchers dare the Players to do more and more dangerous things. 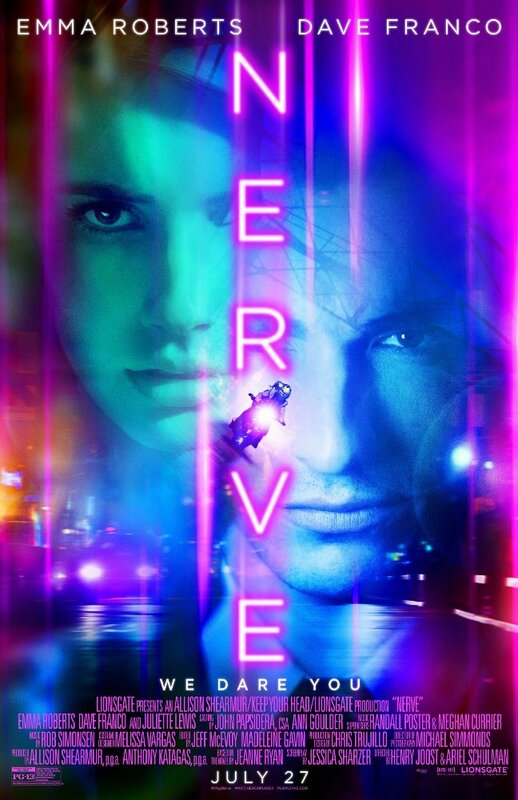 Nerve is a fast-paced, gloriously neon-soaked joyride through New York by night. Emma Roberts and Dave Franco have a definite chemistry and are fun to watch. It’s a thriller with a technological edge, but one which has a certain plausibility and feels like the writers actually know how social media works. People will say and do a lot of things hidden behind the anonymity of a phone screen, and people will do a lot more to become famous on the internet. Great fun, even if it does falter slightly in the final act where a bit of moralising comes to play. It’s a minor niggle though, and worth going along for the ride. 96 minutes well spent. Fun for awhile, until the ending, which gets a little crazy. Nice review.